» :D Calling Me hacker :D true ?? » DeMoNCloWn first deity member. 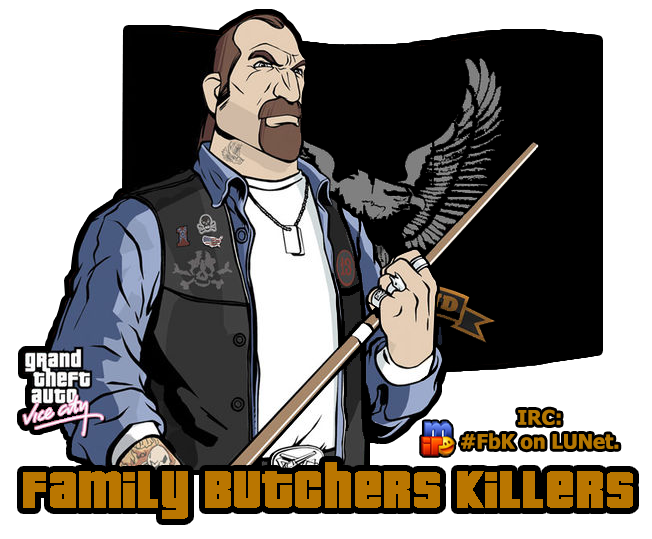 Family Butchers Killers [FbK] is a VC:MP clan which was founded on november 18th, 2014 by Azulej with cooperation of Meth! and Tubbs. Now a lots of dreams have started with this family who expects to grow in reputation and be recognised for all VC:MP players like a redoubtable clan. Our goal is, recruit loyable, mature, cooperative and friendly players, who wants to contribute and help us day after day with the improvement of this amazing proyect. Actually, clan applications are currently open. Don't be shy, perhaps you will fit here perfectly, feel free to make an application following the correct format and place it here. "It's always a good day in FbK"